AV Stumpfl received accolades for Wings Engine Stage media server and Monoclip screen system, both showing for the first time at InfoComm 2017 and voted for and recognized by the industry. Pictured from left: Virginia Hansen, General Manager, AV Stumpfl USA; Fabian Stumpfl, CEO, AV Stumpfl; Tobias Stumpfl, CEO, AV Stumpfl; Franklin Moore, President, AV Stumpfl USA; and, Helmut Protte, Global Business Development Manager, AV Stumpfl. Photography John Staley. Out of over 950 exhibiting companies, AV Stumpfl is one of the very few to scoop multiple awards for innovation. On June 13, MONOCLIP won the Rental & Staging Award for Best Projection Screen. It has all the features of the acclaimed MONOBLOX system with a full clean profile without studs and press snaps. The MONOCLIP's entire frame block unfolds and the snap joints lock automatically for an ultra-fast set-up process. The MonoClip vinyl surface can be stretched easily and attached to the frame with patented QuickClip hooks. 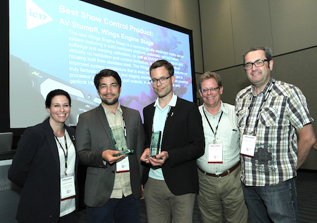 The fully upgraded Wings Engine Stage media server also won a Rental & Staging Award for Best Show Control Product. It combines a durable hardware platform with automatic camera based softedge and warping calibration features and DVI/3G-SDI Live inputs. An improved system architecture is even more shock absorbent, ideal for all rental and staging environments. It has a powerful Xeon processor and Display Port 1.2 outputs, in addition to framelock and genlock inputs.